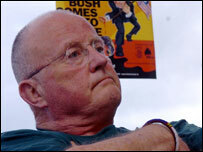 Folk singer Christy Moore has criticised North Wales Police for questioning him at the port of Holyhead for two hours as he arrived by ferry. The Irish singer-songwriter, who was on his way to gigs, said he was angry and disturbed by invasive questions about his family and his songs. A Sinn Fein spokesman said: "This doesn't help the peace process." Police would not comment on individual cases but said they tried to minimise inconvenience to travellers. Sinn Fein's spokesman on justice, equality and human rights, Aengus O'Snodaigh, said: "Irish people have had this for years where they'd be pulled in for questioning under the Prevention of Terrorism Act. "It's sad to see it's still going on." Mr Moore, who is performing in Liverpool this weekend, said that he and his driver were at the beginning of a queue of six vehicles coming off a ferry at Holyhead on Monday. All the other cars were searched, but police did not inspect Mr Moore's car, which was carrying up to 12 instrument cases and microphone equipment. Mr Moore and his driver were then taken into separate interrogation rooms and question under anti-terrorism laws. He said: "It was heavy and harassing and invasive and scary. I was at times quite frightened. It was a disturbing and scary episode. Mr Moore said the officers asked him about his children, what they were doing, and how much they were earning. The said they also asked his driver for the names of his siblings and his deceased parents, and both were questioned on what kind of houses they had, how many bathrooms and what kind of cars they drove..
"I was wondering what the hell was going on," he told RTE Radio. "What were these guys trying to do? I didn't want to get angry even though I was feeling angry. "It's not really acceptable. I can't really make very much sense of it. I felt quite sad about it because this type of thing is still going on. A North Wales Police spokeswoman said: "Police working at the port comply with legislation which allows us to conduct stop checks with people travelling through the port under the Terrorism Act 2000. "We try to reduce inconvenience to people travelling through the port as much as we can." After the incident, Mr Moore decided to make a diplomatic complaint and contacted the Irish ambassador in London and spoke with officials at the Foreign Affairs Department in Dublin. He said he and his driver will make full statements to the Foreign Affairs Department when they return next week. 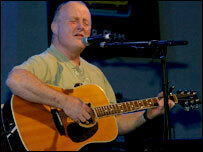 Mr Moore has been a singer for 40 years and recently reformed his band Planxty, after more than 20 years.